Carrying sunflowers and chanting “Chevron no, Richmond yes!” more than 1,000 demonstrators marched Saturday from the Richmond BART station to the gates of the Chevron refinery to protest the powerful oil company and raise awareness about climate change. Police arrested 210 people for trespassing. At the Richmond refinery, an estimated 2,800 people gathered to listen to speeches by environmental activists, including Bill McKibben, author and cofounder of the environmental organization 350.org who led a sit-in on Chevron property. Richmond Mayor Gayle McLaughlin addressed the crowd at the BART rally earlier. At the Chevron sit-in, the crowd chanted and applauded in solidarity as police handcuffed the peaceful protestors with zip-ties and took them to a local fire station to be processed. McKibben was one of the first arrested. All the protesters were later released. 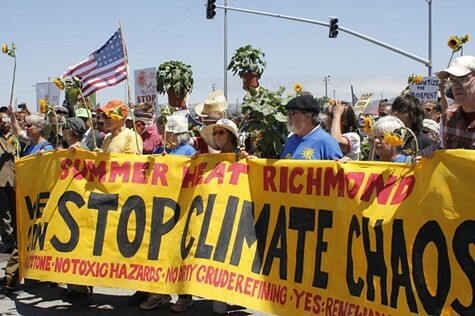 The Summer Heat march marked the one-year anniversary of the August 6, 2012 Chevron refinery fire that sent a huge black cloud of smoke over Richmond and forced 15,000 residents to the hospital to seek treatment for respiratory problems. McLaughlin said at a news conference on Friday that the lawsuit isn't about the money, but about impacting the Chevron corporate culture and making the company accountable to the city. In 2012, after a string of accidents, Chevron still paid its CEO, John Watson, $32.2 million— a thirty percent increase from the year before. The crowd of protesters was diverse and drew people from all over the Bay Area. Organizers with the group 350.org were especially pleased to see that labor groups also joined the march. Members from the Service Employees International Union (SEIU) and a group of Richmond nurses attended the protest. 350.org has organized a string of protests and marches across the country this summer, including a rally in Washington DC to protest the Keystone XL pipeline, and actions in nine other states. Henn said that momentum is building, as record heat-waves and a growing body of scientific evidence (like Stanford University's report on climate change published last week) raise awareness about the realities of global warming. “Now's the time to get out of the stands and rush the field!” said Henn. Correction: The original version of this post misspelled Jaime Henn's last name. After the owner of Bissap Baobab was arrested for allegedly illegally obtaining citizenship, immigration lawyers worry about more denaturalization cases — which could be bad news for the local restaurant industry.